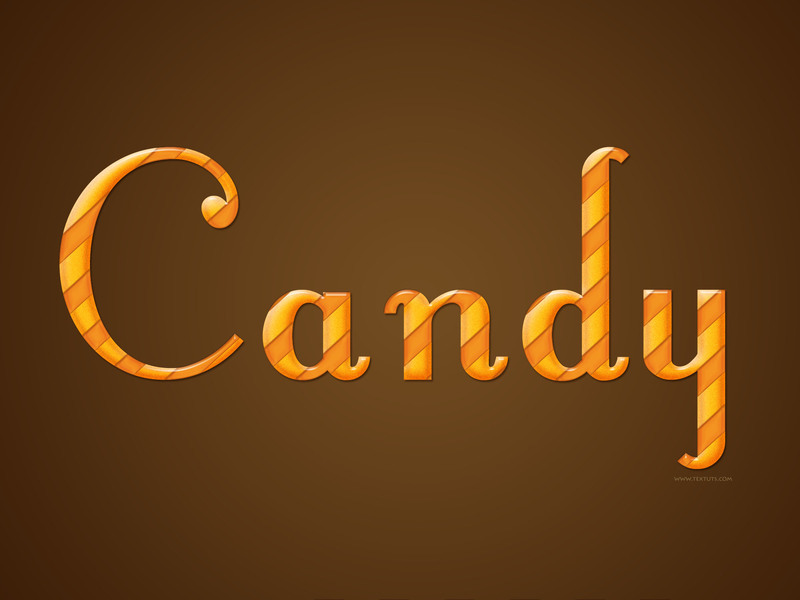 This tutorial will help you create a really simple, but awesome glossy candy text effect in Photoshop. Create a new 2000 x 1500 px document, and fill the Background with the color #724c21. 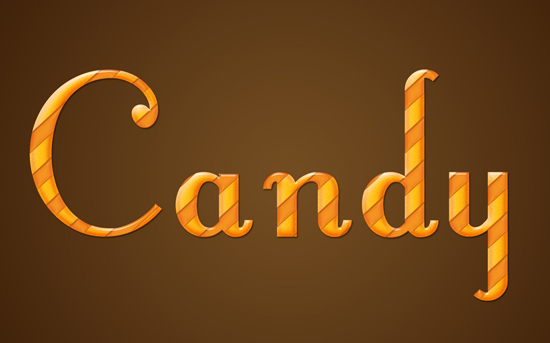 Create the text using the font Fontleroy Brown NF, the Size 1000 px, and the color #ee9b0f. Duplicate the text layer, and make the copy invisible (by clicking on the eye icon next to it). Ctrl/Cmd + Click the original text layer’s thumbnail to create a selection. Create a new layer on top of the text layer and call it Noise. Fill the selection with the original text color #ee9b0f and make sure that it’s the Foreground color as well, and set the Background color to White. Then go to Filter > Noise > Add Noise. Change the Amount to 150, make sure that the Distribution is set to Gaussian, and check the Monochromatic box. With the Noise layer still active, zoom in (Ctrl/Cmd + ‘+’) until you are able to see the pixels clearly. Pick the Magic Wand Tool, un-check the Contiguous box in the Options bar (this will let all the pixels of the same color range be selected, whether they are adjacent or not), and select the darkest pixel or group of pixels. Then, hit Delete. Change the Noise layer’s Blend Mode to Soft Light, and its Fill value to 50%. Create a new 110 x 50 px document, and set the Background Contents to Transparent. Draw a 50 x 50 px square using the Rectangle Marquee Tool. You can open the Info panel (found under the Window menu) to help you make sure that the rectangle’s width and height values are 50 px. Place the square at the center of the document, then fill it with the color #e8641b. Go to Select > Deselect, then go to Edit > Define Pattern and type in the name of the pattern. Go back to the original document, create a new layer on top of the Noise layer, and call it Lines. With the Paint Bucket Tool selected, change the Fill type to Pattern, and choose the pattern you’ve just created. Fill the Lines layer with the square pattern. Go to Edit > Transform > Rotate to rotate the lines until you think the result is good. Hit Enter/Return to accept the changes. Then, Ctrl/Cmd + click the original text layer’s thumbnail to create a selection. Make sure that the Lines layer is selected, then go to Select > Inverse, and hit Delete. Press Ctrl/Cmd + D to get rid of the selection. Go back to the duplicated text layer created back in Step 1, and make it visible once again. Add a layer on top of the Background layer, set the Foreground color to Black, and with the Gradient Tool, choose the Foreground to Transparent fill, click on the Radial Gradient icon, and check the Reverse box. Starting from the center of the document, click and drag to one of its corners to create the gradient fill. Change the Blend Mode of the layer to Soft Light. Many thanks for your comment as well. hope you enjoy the other tutorials as well. wow! this will be my go to for girly projects! I really like your version as well! It’s nice to see the concept applied in different ways. Just followed your tutorial on text and came across your note pappers at footer, do you have a tutorial about them? Thank you for the comment. Actually I don’t currently have a tutorial, as the site is dedicated for text effects tutorials. But I used rectangle shapes and added some anchor points to create the note papers, then added some textures and shadows! You can contact me through the contact form if you’d like to ask about any details. I have one word for it. WOW ! I love all your tutorials, there are really well explained & super useful to learn more about all the posibilities of CS5! You’re the best !! And of course, THANK YOU for sharing them with us. I’m so glad you found the tutorials helpful. Thanks a lot once again for the comment. Thank you very much. Great teaching.